Tourism minister has no authority over gallery. ‘Artists should be consulted. 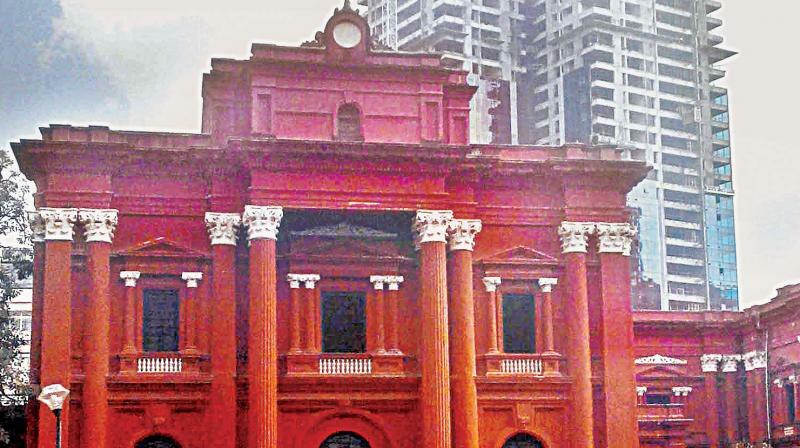 Bengaluru: Artists from across the state have expressed their surprise at the decision of Tourism Minister Sa Ra Mahesh to demolish and reconstruct the Venkatappa Art Gallery (VAG). Members of the VAG Forum questioned as to how the tourism minister took the decision when the gallery comes under the Department of Archaeology, Museums and Heritage under the Minister of Kannada and Culture, the mother department. "Why is the Kannada and Culture Minister silent about this," they asked. "A proper democratic process would involve consulting technical experts before taking or announcing any decision. Why were the structural engineers not consulted before coming to a conclusion? On what basis a minister on his first visit concluded that the VAG building is sinking because of the moat around it? This shows an ulterior motive, a clear intent to demolish, prior to an inspection and consultation," the artists said. "Such an announcement, without an evaluation by technical experts and without any discussion with representatives of the artist community, shows scant respect to democratic processes," they said. A few artists met at VAG on Wednesday to discuss the reason behind the hasty decision and the action needed to save VAG. "Artists have worked with successive governments for the growth of VAG. The furore a few years ago over a decision to hand over of VAG for adoption by a private enterprise is not far from memory. The artist community has been quite clear in their protests and appeals to the government to respect and safeguard the space meant for artists. We have repeatedly requested for proper maintenance and upkeep of VAG. It is high time that the government hears out the needs of artists and initiates a dialogue with our community," they said. The members said that it is not for the tourism department to conclude that the VAG building is beyond repair. "It was the Tourism Department that was willing to let a private enterprise take up VAG for adoption for an indefinite period. Surely then, the building must be stronger than is being projected now," they said. VAG was built as a museum to house K. Venkatappa's works and also to provide a gallery for contemporary artists, to exhibit their works and for their artistic practice. Any decision concerning VAG should be in discussion with the artist community. Why was the artist community not called for a discussion before such an important announcement was made to the press? This displays a total apathy towards the artist community, they said. "Artists who use and visit the gallery regularly have not seen any major cracks. There is only some rain seepage and there are certainly no major problems that cannot be solved with the consultation of experts, the will of the government, evaluation of structural engineers, annual maintenance and necessary steps to stop water seepage from the moat to safeguard the building's foundation. Demolition is an extreme option that points to other intentions," they argued. "As per the original plan, VAG was to have five floors, of which only ground plus two floors have been built. The building, which was planned for five floors, will have the foundation for five floors. If the building is unsafe with just two floors then the quality of construction by state PWD remains questionable," they said. "The Tourism Minister's statement fails the very purpose of VAG. How is the Tourism Minister planning to house the historic artefacts stored in 50 lockers of Government Museum on one floor of the proposed gallery that will be build after the demolition of VAG? Let the government not forget that VAG is a museum of modern and contemporary art and not meant to be an extension of the government museum or its relics," they pointed out. They urged the government to engage with the artist community to visualise a future plan for VAG that is inclusive, transparent and democratic.